We have teamed up with Twentieth Century Fox Film for a VERY special competition - the chance to win two tickets to the Tolkien premiere in London on April 29. As well as tickets to the premiere, the prize includes hotel and flights for the lucky winner plus their guest. 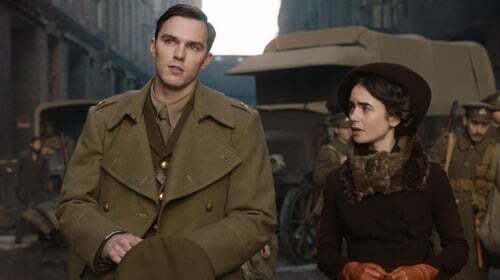 Tolkien stars Nicholas Hoult as the famed writer J. R. R. Tolkien and explores the formative years of the orphaned author as he finds friendship, love and artistic inspiration among a fellow group of outcasts at school. This takes him into the outbreak of World War I, which threatens to tear the "fellowship" apart. All of these experiences would inspire Tolkien to write his famous Middle-Earth novels. Who plays writer J. R. R. Tolkien in the new biographical film Tolkien? Send the answer along with your name and phone number to entertainmentonline@rte.ie with 'Tolkien Competition' in the subject line. One entry per person. You must be over the age of 18 to enter. Tolkien is out in cinemas on May 3. Standard RTÉ competition rules apply, a copy of which is viewable here. Economy flights from select airports in Dublin only, flights may be indirect and not all routing will be available, flight itinerary will be selected by the prize provider at their sole discretion; a valid credit or debit card will be required for security deposit purposes when checking into hotel accommodation; Hotel accommodation is based on two adults sharing one room with two beds; Hotel will be selected by prize provider at their sole discretion; Prizes are non-transferable and non-refundable; No cash alternative is available; Prize is subject to availability; All elements of the prize must be taken at the same time; once booked, the prize cannot be altered or amended; at least one traveller must be aged 18; Where any travellers are aged under 18, they must have prior parental or guardian permission; all travellers will require a passport valid for at least 6 months on date of travel; any necessary visas or insurance are the responsibility of the winner and guests; The prize excludes domestic ground transfers; The prize excludes meals and drinks, excursions, attractions, treatments, car hire, visas and personal expenses and anything not expressly included in the prize; Premiere is set to take place on the set date of April 29 2019 and it is the winner’s responsibility to be available to travel to London for arrival on the morning/afternoon April 29, returning from London on April 30 2019.